Let’s be honest – running or walking with a group of people can be much more enjoyable than pushing through the miles alone. What do you do when you want to train for an event with others and the squirrels seem like your only option? You forget those furry minions and start your own training team! Think about whose company you’d enjoy most during your sweat sessions. Neighbors, coworkers, fellow church goers? Once you have your target group in mind, garner interest for your team. Ask around the office, call your friends, or if you’re really bold, post your intentions on Facebook. Try to find a group of people that walk or run at a similar pace so that you aren’t struggling to stay together during training. Consider setting a goal. “Once I have five people willing to try this with me, we’re going to get started!” This will help you get to the fun part sooner! Once you have developed a solid base of committed teammates, you must tackle the ultimate decision as a group: What are you training for? Select an event or race that everyone will train for together. Develop camaraderie among your group. Design team t-shirts, create a Facebook page for your group, bedazzle your matching running shoes…it’s your team, your call. How is your team going to pull this off? This question involves a little forethought and can be a bit overwhelming, but try not to overthink it. Technology has made just about every aspect of our lives a little bit easier (for the most part), so take advantage of Google and other online resources to help you develop a training plan for your team. When using Google or any other search engine, keep your search phrases short and precise. For example, “beginner 10k training plan” or “couch to 5k” will generate plenty of options for you to consider. Also, take advantage of your teammates. They are not only great social support but can help you with all of the other training team logistics. You and your group can decide who will be in charge of arranging post-workout brunches. Someone else can help sort out all of the details for race-day preparation (bib pickup, parking, etc.). Another team member can map out the routes. Divide and conquer! Will you and your team run together during the week? Will you run mornings or evenings? Determine the number of times per week that your group will meet to train together and establish a time of day that works best for everyone. Generally, consistency is the ticket here. Make your meet-up times pretty reliable. Make sure that everyone records the meet-up times for your group in their planners, phones, or the palms of their hands (old-school style). Post the times on your group’s Facebook page and develop an accountability system so that teammates can remind each other of upcoming group runs. Around the office on city sidewalks? Along a park trail? In your neighborhood? Pick the location(s) of your group training walks/runs and map out your training routes ahead of time so that no one gets lost along the way. Again, make use of technology. MapMyRun.com and Gmaps Pedometer are both user-friendly websites that allow you to measure your training distances. If you have a particularly adventurous group, you can use apps like Endomondo to keep track of your group’s mileage en route. If your group does not want to carry water while walking or running, make sure to create routes that loop back to a safe spot to store your replenishments for water breaks. Pro tip – Don’t get stuck on this step. You’re location each week doesn’t have to be perfect. You can do a little trial an error. So, when in doubt, just go with something. You can adjust as you go! Believe it or not, this last step is the most important one. The “why” gives purpose to the who, what, how, when, and where. Other than a common dislike for squirrel companionship, why does your group want to train together for an upcoming race or event? 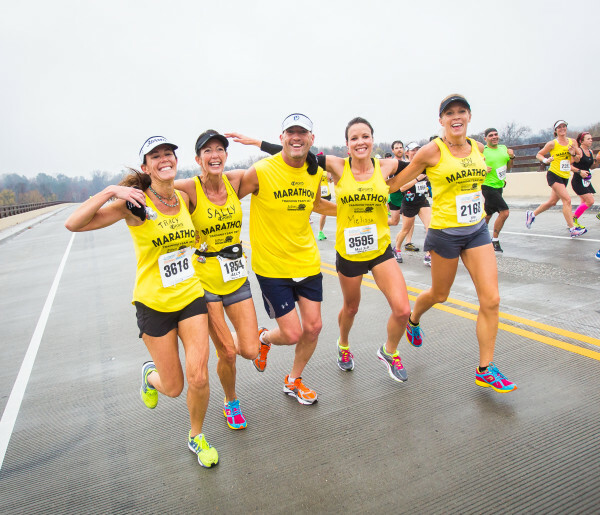 Whether your group’s goal is to lose weight and improve health, to fundraise money for a charity, or to strengthen your bonds of friendship, figure out why you want to train together so that you will indeed keep training together. The steps above are merely tips to get you started. Be creative and remember that training teams are meant to be fun! And remember to stay safe while training on the streets. If your group is training during dawn or dusk, make sure to wear reflective clothing and carry flashlights to make yourself visible to drivers. Always run facing traffic (the left side of the road) so that you can view oncoming cars and make eye contact with drivers to ensure that they see you. Stop at every traffic light and stop sign before crossing the street and when in doubt, let cars cross the intersection before you step foot in the road. If you’re looking for a little inspiration before you start your own team, there are great groups in town that organize training teams that are open to everyone and one of these teams could be a good fit for you. The Sports Backers have training teams for their 8k, 10k, half marathon, and marathon. The Richmond Road Runners Club organizes and supports several running groups throughout the year. Whether you start your own team or decide to join a pre-existing one, good luck! And give the squirrels a little competition.